A year ago, as U.S citizens of both political parties were developing a fascination with Donald Trump, no pundits came forth with a mythic or religious way to understand Trump’s appeal or his ability to strongly repel those not attracted to him. As I teach college courses on the intersection of religion and politics, I was hoping that someone quicker and wiser than I am would come forward to situate the Donald in the world of archetypes, and remove him—if only briefly—from the world of stereotypes. One of our Canadian cousins echoed his sentiments. In September 2015, Neil Macdonald, Senior correspondent for the Canadian Broadcasting News, offered CBC News readers what I consider the most apt archetype for Trump—the Golem. 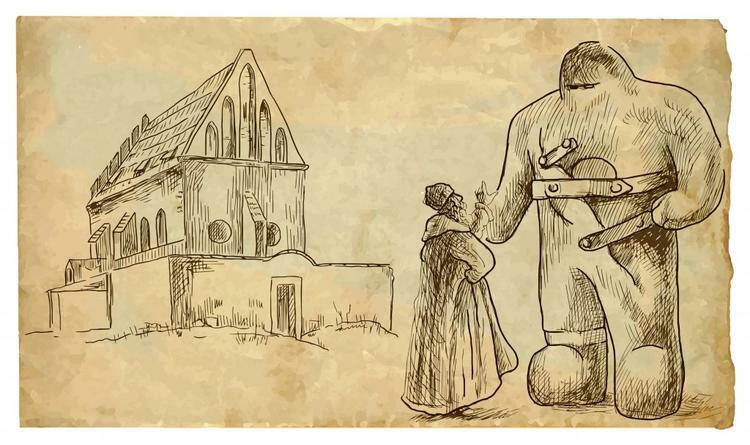 Associated in Jewish folklore with the the city of Prague, the Golem was a creature created to protect the Jewish community from harm. The Golem was created, or rather, animated from a large lump of clay that lay inert in the rabbi’s attic study. The rabbi wrote the divine secret name of God on the Golem’s forehead; then the creature sprang to life. To stop the Golem from running amok the rabbi had to catch and subdue the creature and erase the magic name from its forehead. But as the Golem grew more powerful, his creator, the wonder-working rabbi of the city, could no longer control him. The Golem ran amok, harming the very people he was created to protect, along with anyone else who got in his way. Soon after that CBC article, a few U.S. journalists, primarily those veterans of an era of journalism in which the cultural references were richer and more varied than they are today, started using the “Trump as Golem” meme. Over the past year “Trump as Golem” has finally caught on. And last week, just before the election, Trump as Golem and his “make America Great Again” baseball cap have surfaced in the unlikeliest of places—Berlin’s Jewish Museum. In an exhibit dedicated to the history of the Golem in art and mythology, the museum chose to include a Trump cap in the exhibit. The cap, with the rest of exhibit, will be at the museum for a few weeks into the first 100 days of the next Washington administration. Shalom Goldman is professor of religion at Middlebury College. He has authored numerous books, including Zeal for Zion: Christians, Jews, and the Promised Land and God’s Sacred Tongue: Hebrew and the American Imagination. His most recent book, Jewish-Christian Difference and Modern Jewish Identity, has recently been featured in the Patheos Book Club. Reprinted from Patheos.com with author’s permission.